The Madison carbonate-evaporite system was deposited in carbonate-platform environments that graded laterally and vertically to deep-water facies. 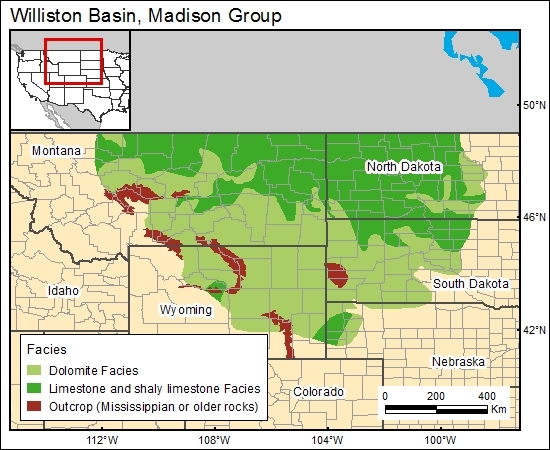 The Madison Group is formed by the Lodgepole Limestone (cyclic carbonate sequence), Mission Canyon Limestone (coarse limestone to finer limestone and evaporates at the top), and the Charles Formation (evaporite sequence, anhydrite, and halite). Vertical leakage is restricted by shale, halite beds, and stratigraphic traps or low-permeability zones.